Recently I have been asked again on why Islamic Banks still uses a lot of Debt-based Financing products, instead of moving to Equity-based Financing products, which on perception was supposed to be more “Islamic”. Yes, ideally an equity-based financing do equate to a more “Islamic” structure, if your definition of being more “Islamic” is risk-sharing. 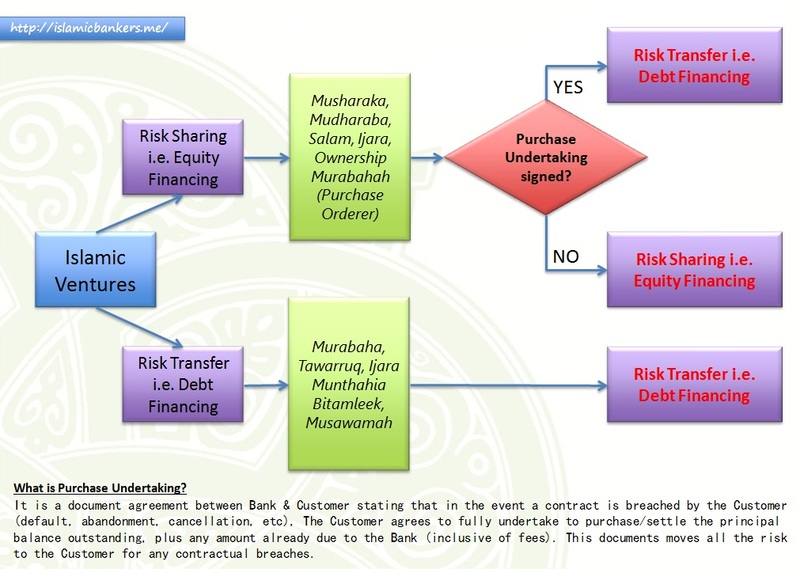 Not all structures must be risk-sharing; transfer of risks are definitely acceptable in Islamic Banking circle. The idea is an age old idea; if you undertake a low-risk structure or there is no risks for the bank (where all risks are transferred to customers) then technically the bank should earn low returns for it. If the risks are higher i.e. Bank carries the risks, Banks would be entitled to higher returns. High risk equates to High returns. BUT IN REALITY, ARE COMMERCIAL BANKS SET UP LIKE THESE? If an Islamic Bank operates in the same environment as a conventional Bank, it is difficult to imagine having two models running side by side I.e. 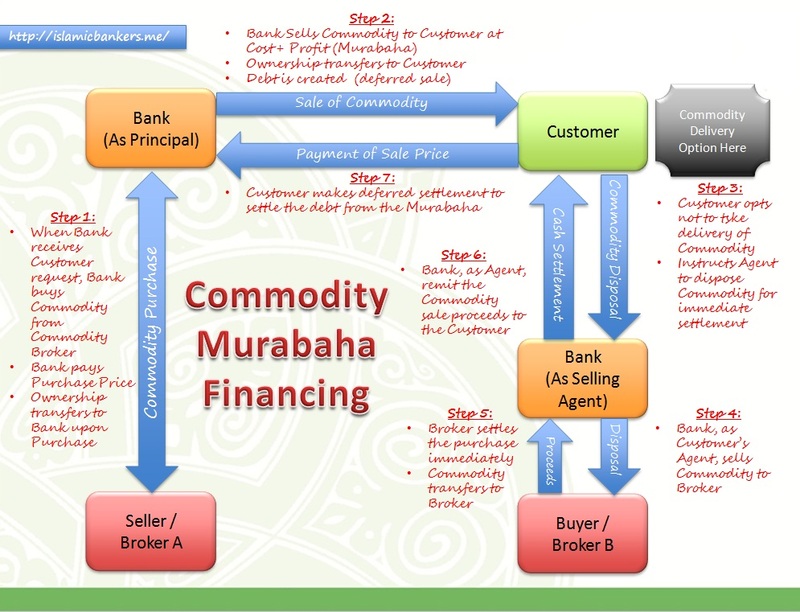 the Islamic Banks operating an equity-based business and conventional Banks operating a debt-based business. The risk profile of these banks would be significantly different, and this affect many areas in banking; risk rating, cost of funding, profile as well as capital requirements. The bank with the perceived higher risk rating will ultimately become less competitive. The real truth is that the shareholders of traditional banking set up expects the following: medium to high returns on their equity at the lowest risk and operating cost as possible. In short, their “investment” must record the best Return on Investment (ROI) as possible. Based on this view, debt-based financing can fill that criteria. SO WHAT ARE DEBT-BASED FINANCING STRUCTURES? 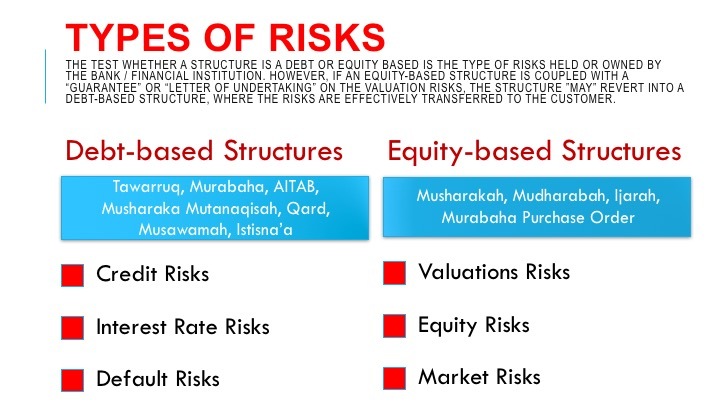 Many have the perception that equity-based structures and debt-based structures are dependent on the types of contract employed by an Islamic Bank. To a certain extent, this may be true. Certain contracts by nature promotes the sharing of risks (which is equity financing) while others rely on the transfer of risks (which is debt financing). 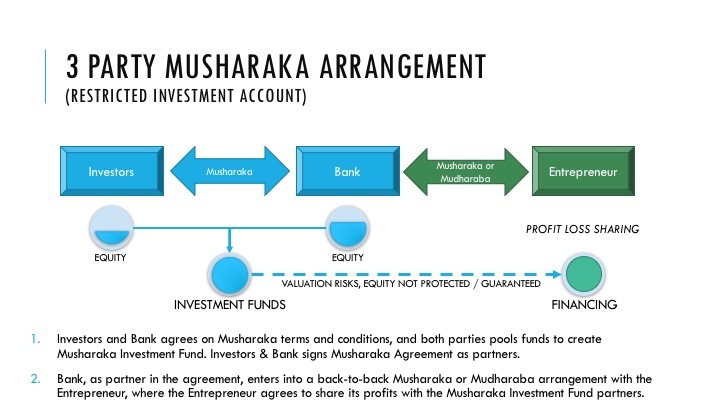 For example, a Musyaraka (partnership) structure is traditionally an equity financing structure, where the Bank and customer enters into a partnership arrangement with both parties giving capital into the venture. Risks on the venture is shared according to equity ratio, and so is the returns where it will also be shared. The risk factor is therefore elevated because there is a possibility of losses being shared between Bank and customer. So, many Banks prefer the safer haven of Debt-based financing. 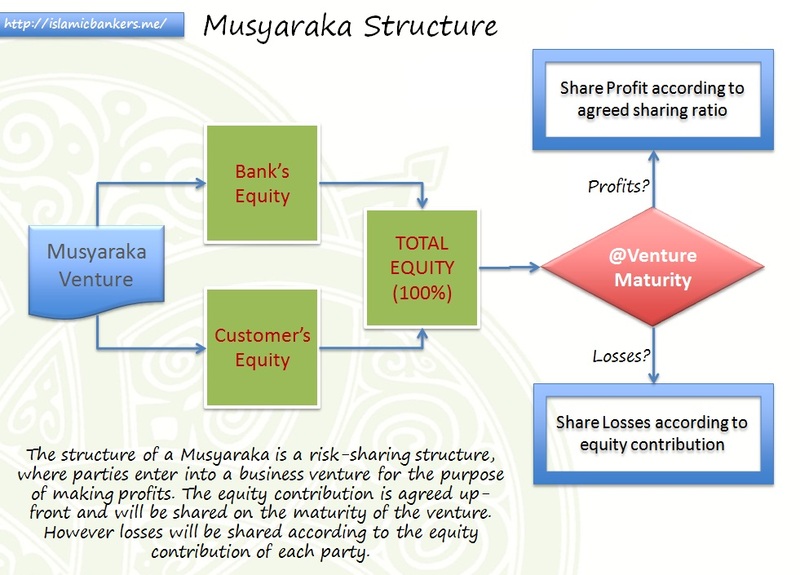 How, then, do you change a Musyaraka structure into debt-based? Simply by providing a purchase undertaking, a document agreed and signed which states that should the venture go bust, then the customer agrees to undertake the purchase of the Bank’s remaining share in the venture thus making the amount to be immediately due by the customer. This is in a way, an indemnity given by the Customer to provide assurances during contractual breaches. By having a purchase undertaking document, the risks are effectively transferred to the customer in times of default. The Musyaraka therefore still works where profits are shared during the good times, but dissolves in spirit during bad times when purchase undertaking document takes effect. The talk about having an equity-based financing is usually moot with the use of purchase undertaking document. The element of risks is removed for the Bank, and puts the product on par with its conventional banking product equivalent. So will we ever see Equity-based financing? Shareholders who understand the risk nature of equity based contracts, the way venture capitalist understand venture capitalism. Risk and return are greatly considered but more importantly, the possibility of losses. Bank with a risk appetite outlined for greater risk-taking. The risks to be understood and accepted. Then the venture in entered into with eyes open although it will take time for a Bank to understand the business risks they take under equity-based structures. Customers willing to stomach the losses or share the spoils of profits. It will take even longer time for customers themselves to be able to accept the structures under equity-based. Customers must be able to understand that they are active partners in a venture, the responsibilities and also the sharing aspect of it; they don’t just share the losses with the Bank, but also the profits or gains with Banks as well and this can be above and beyond what they can traditionally accept. To achieve this, it will take significant paradigm change for everyone when they have only the financing structures in mind. In actual fact, such structures are already common in the consumer psyche as there are similar structures when they deal in unit trusts, shares or other types of investments, where risks are taken. But to flip it into an “equity financing” concept will remain a challenge to Islamic Banks that are serious to offer something significantly “Islamic”.